Illahee State Park is a 82-acre (33 ha) Washington state park located in the hamlet of Illahee, just north of East Bremerton, on Port Orchard Bay, part of Puget Sound. The word "Illahee" means earth or country in the Native language Chinuk Wawa. The park was established when Kitsap County donated 13 acres to the state in 1934. The park's old-growth stand is home to one of the nation's oldest Pacific yews, which has been standing for approximately 400 years. Park activities include picnicking, camping, hiking, boating, and shellfish harvesting. ^ a b "Illahee State Park". Geographic Names Information System. United States Geological Survey. ^ a b "Illahee State Park". Washington State Parks and Recreation Commission. Retrieved August 14, 2018. 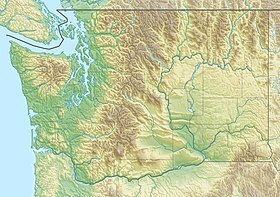 Wikimedia Commons has media related to Illahee State Park. This page was last edited on 12 November 2018, at 04:15 (UTC).